Currently, of any of the options for treatment, renal transplantation offers children with ESRD the best opportunity for growth and development. Allograft and patient survival both have demonstrated consistent improvement in the 5 decades during which renal transplantation has been available. This has been the result of improved understanding of the immune response to allografting and the development of increasingly specific strategies to protect a kidney transplant from the body's natural defenses while leaving the recipient protected from infection. For patient education information, see Kidney Transplant. Until the 1950s, ESRD from any cause was uniformly lethal. Hope for treating renal failure grew with the development of surgical techniques that allowed the anastomosis of blood vessels, in the early 20th century, and elucidation of the pathophysiology of rejection, starting in the mid-20th century. In 1902, Ullman demonstrated the successful autotransplant of a canine kidney to the dog's neck. Following anastomosis of the artery and vein, the kidney made urine. That same year, Carrel reported an improved method of suturing vessels together, work that eventually won him a Nobel Prize. In 1906, Jaboulay, in whose laboratory Carrel had worked, performed the first human kidney transplant, a xenograft between a pig and human. This kidney made urine for only a short time. In 1909, Ernst Unger transplanted an ape's kidney to a young girl with renal failure. The failure of this attempt convinced Unger that a nonsurgical barrier to transplantation existed. Other early attempts at the transplantation of kidneys were unsuccessful. Within hours or days, transplanted kidneys became swollen, ceased urine production, became ischemic, and, in some cases, ruptured. In a series of experiments, Medawar and colleagues demonstrated that skin grafts from nonidentical rabbits were rejected and sloughed by a reaction involving leukocyte invasion of the graft. This reaction increased in severity and rapidity when the recipient received a previous transplant from the same donor. Researchers began to look for ways to prevent this response. Ionizing radiation, known to suppress bone marrow production of leukocytes, was used in an attempt to prevent the immune reaction to allografting. In the early 1960s, Calne found that a derivative of 6-mercaptopurine (azathioprine) increased the success of experimental kidney transplantation in dogs. Human use of azathioprine followed, and long-term graft survival from nonidentical donor kidneys became a possibility. The success of kidney transplantation increased significantly when Goodwin and Starzl added prednisolone to azathioprine. [11, 12] Encouraged by this success, transplant centers began performing nonidentical living donor kidney transplantation. Simultaneously, dialysis became available as a pretransplant therapy for patients with ESRD and as a life-preserving measure for recipients of transplants whose kidneys failed. This increased the number of individuals who were candidates for kidney transplantation. Terasaki reported a marked decrease in early allograft failure from hyperacute rejection when a crossmatch between donor lymphocytes and recipient serum was performed. A negative crossmatch (no reaction against donor lymphocytes when incubated with recipient serum) indicated that no antibody was present in the recipient, directed against the donor's organ. In 1968, the Harvard Committee on Irreversible Coma described the features of brain death and made the important observation that patients who had lost basic brainstem function were dead despite the persistence of a heartbeat sustained by artificial ventilator support. In 1970, Kansas became the first state to enact legislation defining brain death. Within several years, such statutes were widely established. This provided a legal framework for families to donate the organs of deceased loved ones for use in transplantation. The number of kidney transplants dramatically increased because of the combination of this legislation and the contemporary advances in immunosuppression. Concurrently, in 1973 the Medicare program in the United States was expanded to provide insurance coverage for patients with ESRD, meaning that individuals were provided renal transplantation or dialysis regardless of their health insurance coverage or their ability to pay. From a relatively rare procedure performed in research centers, kidney transplantation became available in most major cities. During the 1970s, a 1-year allograft survival rate of 75% was typical for kidneys donated by living relatives; a rate of 50% was typical for organs from cadavers. Improvement in graft survival followed the routine use of human leukocyte antigen (HLA) tissue matching  and the use of antilymphocyte antibodies as a temporary adjunct to immunosuppression regimens. In 1978, Calne reported improvement in allograft survival with the use of a new immunosuppressive agent, cyclosporine. Widespread use of cyclosporine led to a dramatic improvement in allograft survival. New protocols incorporating cyclosporine and other drugs have increased the specificity of immunosuppression and decreased the prevalence of infection complications in transplant recipients. Despite numerous attempts and prolific experimentation, kidney transplantation between nonidentical twins was not successful until the 1960s. Early experimenters understood the outcome of the unmodified response to allografting (ie, a rapid or gradual decrease in urine output and ultimate demise of the transplanted kidney) but not its mechanism. In the 1940s, through a series of elegant animal experiments, Medawar demonstrated that skin grafts between nonidentical rabbits were ultimately sloughed. He found that this reaction occurred much more rapidly in animals that had previously been grafted from the same donor and that the process involved a leukocytic infiltration in the allograft. Medawar reasoned that exposure to foreign tissue resulted in an activation of the immune system and that it induced specific memory that allowed rapid reaction to subsequent exposure to similar grafts. Modulation of that response became the goal of transplant investigators in the subsequent decades. Although understanding of the immune response to allografts has dramatically increased over the 50 years since Medawar's experiments, it remains incomplete. The description that follows is a simplified schema intended primarily to assist in the reader's understanding of currently used immunosuppressive agents. Histocompatibility antigens are glycoproteins found on the cell membrane of all nucleated cells. These antigens (ie, HLAs) widely vary between individuals and are coded by genes located on the short arm of chromosome 6. Following allografting, the recipient is exposed to foreign HLAs from the graft. Macrophages or dendritic cells process these foreign antigens and present them to T-helper lymphocytes. Thus activated, the T-helper lymphocytes produce lymphokines that stimulate maturation of other reactive cells. Interleukin (IL)–2 stimulates production of cytotoxic T lymphocytes. IL-4 induces transformation of B lymphocytes into plasma cells that produce antibody directed specifically against foreign HLAs. In addition, T-helper lymphocytes can be stimulated directly by the secretion of IL-1 from macrophages (see below). 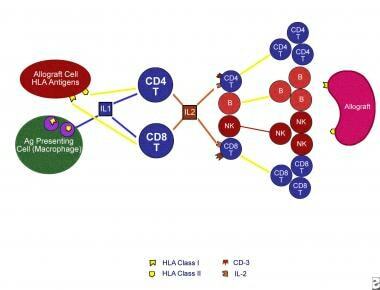 Simplified diagram of the immune response to nonidentical major histocompatability complex (MHC) antigens. Foreign antigens are processed by macrophages or dendritic cells (antigen-presenting cell) and then presented to T-helper lymphocytes. Release of interleukin-1 from macrophages activates T-helper lymphocytes. Thus activated, these T-helper lymphocytes produce cytokines (interleukin-2) that stimulate production of cytotoxic T lymphocytes, antibody-producing B lymphocytes, and natural killer cells. Diagram provided by David A. Hatch, MD, copyright 2001, used with permission. Once stimulated, the immune response results in a rapid or gradual attack on the vascular endothelium of the allograft, resulting in rejection. If an individual is exposed to an organ expressing antigens against which the recipient already has developed antibodies, the rejection occurs rapidly. This is called hyperacute rejection, and it can cause swelling, rupture, and loss of the allograft within minutes or hours. Currently used pretransplant cross-matching techniques (between recipient serum and donor lymphocytes) have dramatically reduced the occurrence of this type of rejection. Obtain a thorough history from all potential pediatric recipients of kidney transplants. Children with acute or chronic active infection and those with malignancy are not generally candidates for kidney transplantation. Most centers will consider transplantation in a child who has been disease free for 2 years following treatment of cancer. Transplantation is also contraindicated in any child or family with a history or high likelihood of noncompliance with a prescribed medication regimen. Active systemic lupus erythematosus and anti–glomerular basement membrane disease (Goodpasture syndrome) are also contraindications to transplantation because these processes can damage an allograft. Children with renal failure from focal segmental glomerulosclerosis, membranoproliferative glomerulonephritis, systemic lupus erythematosus, hemolytic-uremic syndrome, and Henoch-Schönlein purpura are at increased risk of recurrence following transplantation. Although this increased risk does not necessarily contraindicate transplantation, it can have a significant impact on organ survival and function. Counsel families accordingly. The success rate of renal transplantation in very young children, especially those younger than 1 year, is significantly less than that in older children. Therefore, carefully evaluate all alternatives for treatment of end-stage renal disease (ESRD). Generally, continuous ambulatory peritoneal dialysis (CAPD) is the preferred method of treatment of children younger than 1 year. However, CAPD may not be possible because of peritoneal scarring. Hemodialysis is difficult in very small children. In such cases, transplantation may be the best option. Saran R, Robinson B, Abbott KC, et al. US Renal Data System 2017 Annual Data Report: Epidemiology of Kidney Disease in the United States. Am J Kidney Dis. 2018 Mar. 71 (3S1):A7. [Medline]. [Full Text]. Hart A, Smith JM, Skeans MA, Gustafson SK, Wilk AR, Robinson A, et al. OPTN/SRTR 2016 Annual Data Report: Kidney. Am J Transplant. 2018 Jan. 18 Suppl 1:18-113. [Medline]. [Full Text]. Ullman E. Experimentelle nierentransplantation. Wien Klin Wochenschr. 1902. Vol 14: 281. Carrel A. La technique operatoire des anastomoses vasculaires et la transplantation des visceres. Lyon Med. 1902. 98:859. Jaboulay M. Greffe de reins au pli du coude par soudure arte. Bull Lyon Med. 1906. 107:575. Unger E. Nierentransplantation. Berlin Dlin Wochenschr. 1909. Vol 1: 1057. Medawar PB. The behaviour and fate of skin autografts and skin homografts in rabbits: A report to the War Wounds Committee of the Medical Research Council. J Anat. 1944 Oct. 78:176-99. [Medline]. Hume DM, Merrill JP, Miller BF, Thorn GW. Experiences with renal homotransplantation in the human: report of nine cases. J Clin Invest. 1955 Feb. 34(2):327-82. [Medline]. Murray JE, Merrill JP, Harrison JH. Kidney transplantation between seven pairs of identical twins. Ann Surg. 1958 Sep. 148(3):343-59. [Medline]. Calne RY, Alexandre GP, Murray JE. A study of the effects of drugs in prolonging survival of homologous renal transplants in dogs. Ann N Y Acad Sci. 1962 Oct 24. 99:743-61. [Medline]. Goodwin WE, Mims MM, Kaufman JJ. Human renal transplantation III. Technical problems encountered in six cases of kidney homotransplantation. Trans Am Assoc Genitourin Surg. 1962. 54:116-25. [Medline]. Starzl TE, Marchioro TL, Waddell WR. The reversal of rejection in human renal homografts with subsequent development of homograft tolerance. Surg Gynecol Obstet. 1963 Oct. 117:385-95. [Medline]. Terasaki PI, Vredevoe DL, Porter KA, Mickey MR, Marchioro TL, Faris TD, et al. Serotyping for homotransplantation. V. Evaluation of a matching scheme. Transplantation. 1966 Nov. 4(6):688-99. [Medline]. Cranford RW. Brain death. Organ Procurement, Preservation and Distribution in Transplantation. Richmond, Va: UNOS; 1991. 23-31. Banowsky LH. Current results and future expectations in renal transplantation. Urol Clin North Am. 1983 May. 10(2):337-46. [Medline]. Ting A, Morris PJ. Matching for B-cell antigens of the HLA-DR series in cadaver renal transplantation. Lancet. 1978 Mar 18. 1(8064):575-7. [Medline]. Calne RY, White DJ, Thiru S, et al. Cyclosporin A in patients receiving renal allografts from cadaver donors. Lancet. 1978 Dec 23-30. 2(8104-5):1323-7. [Medline]. Bröcker V, Mengel M. Histopathological diagnosis of acute and chronic rejection in pediatric kidney transplantation. Pediatr Nephrol. 2013 Oct 19. [Medline]. Moudgil A, Martz K, Stablein DM, Puliyanda DP. Good outcome of kidney transplants in recipients of young donors: a NAPRTCS data analysis. Pediatr Transplant. 2011 Mar. 15(2):167-71. [Medline]. Foster BJ, Platt RW, Dahhou M, Zhang X, Bell LE, Hanley JA. The impact of age at transfer from pediatric to adult-oriented care on renal allograft survival. Pediatr Transplant. 2011 Nov. 15(7):750-9. [Medline]. Filler G. Challenges in pediatric transplantation: the impact of chronic kidney disease and cardiovascular risk factors on long-term outcomes and recommended management strategies. Pediatr Transplant. 2011 Feb. 15(1):25-31. [Medline]. Dharnidharka VR, Martz KL, Stablein DM, Benfield MR. Improved Survival with Recent Post-Transplant Lymphoproliferative Disorder (PTLD) in Children with Kidney Transplants. Am J Transplant. 2011 Apr. 11(4):751-8. [Medline]. Foster BJ, Dahhou M, Zhang X, Platt RW, Hanley JA. Change in mortality risk over time in young kidney transplant recipients. Am J Transplant. 2011 Nov. 11(11):2432-42. [Medline]. Kaidar M, Berant M, Krauze I, Cleper R, Mor E, Bar-Nathan N, et al. Cardiovascular risk factors in children after kidney transplantation - From short-term to long-term follow-up. Pediatr Transplant. 2013 Oct 18. [Medline]. Shapiro R, Scantlebury VP, Jordan ML, et al. Tacrolimus in pediatric renal transplantation. Transplantation. 1996 Dec 27. 62(12):1752-8. [Medline]. Hocker B, John U, Plank C, et al. Successful withdrawal of steroids in pediatric renal transplant recipients receiving cyclosporine A and mycophenolate mofetil treatment: results after four years. Transplantation. 2004 Jul 27. 78(2):228-34. [Medline]. Hymes LC, Warshaw BL. Linear growth in pediatric renal transplant recipients receiving sirolimus. Pediatr Transplant. 2011 Sep. 15(6):570-2. [Medline]. Kahan BD, Rajagopalan PR, Hall M. Reduction of the occurrence of acute cellular rejection among renal allograft recipients treated with basiliximab, a chimeric anti-interleukin-2-receptor monoclonal antibody. United States Simulect Renal Study Group. Transplantation. 1999 Jan 27. 67(2):276-84. [Medline]. Summers DM, Watson CJ, Pettigrew GJ, Johnson RJ, Collett D, Neuberger JM, et al. Kidney donation after circulatory death (DCD): state of the art. Kidney Int. 2015 Aug. 88 (2):241-9. [Medline]. Hosgood SA, Saeb-Parsy K, Wilson C, Callaghan C, Collett D, Nicholson ML. Protocol of a randomised controlled, open-label trial of ex vivo normothermic perfusion versus static cold storage in donation after circulatory death renal transplantation. BMJ Open. 2017 Jan 23. 7 (1):e012237. [Medline]. [Full Text]. [Guideline] Lentine KL, Kasiske BL, Levey AS, Adams PL, Alberú J, Bakr MA, et al. KDIGO Clinical Practice Guideline on the Evaluation and Care of Living Kidney Donors. Transplantation. 2017 Aug. 101 (8S Suppl 1):S1-S109. [Medline]. [Full Text]. Barry JM. Unstented extravesical ureteroneocystostomy in kidney transplantation. J Urol. 1983 May. 129(5):918-9. [Medline]. Lich R. Recurrent urosepsis in children. Journal of Urology. 1961. 86:554. Heap SL, Webb NJ, Kirkman MA, Roberts D, Riad H. Extraperitoneal renal transplantation in small children results in a transient improvement in early graft function. Pediatr Transplant. 2011 Jun. 15(4):362-6. [Medline]. Tydén G, Kumlien G, Berg UB. ABO-incompatible kidney transplantation in children. Pediatr Transplant. 2011 Aug. 15(5):502-4. [Medline]. Gill IS, Hayes JM, Hodge EE, Novick AC. Clean intermittent catheterization and urinary diversion in the management of renal transplant recipients with lower urinary tract dysfunction. J Urol. 1992 Nov. 148(5):1397-400. [Medline]. Hatch DA, Koyle MA, Baskin LS, et al. Kidney transplantation in children with urinary diversion or bladder augmentation. J Urol. 2001 Jun. 165(6 Pt 2):2265-8. [Medline]. Flechner SM, Saad IR, Tiong HY, Rabets J, Krishnamurthi V. Use of the donor bladder trigone to facilitate pediatric en bloc kidney transplantation. Pediatr Transplant. 2011 Feb. 15(1):53-7. [Medline]. Renoult E, Buteau C, Lamarre V, Turgeon N, Tapiero B. Infectious risk in pediatric organ transplant recipients: is it increased with the new immunosuppressive agents?. Pediatr Transplant. 2005 Aug. 9(4):470-9. [Medline]. Silkensen JR. Long-term complications in renal transplantation. J Am Soc Nephrol. 2000 Mar. 11(3):582-8. [Medline]. Bock GH, Sullivan EK, Miller D, et al. Cytomegalovirus infections following renal transplantation--effects on antiviral prophylaxis: a report of the North American Pediatric Renal Transplant Cooperative Study. Pediatr Nephrol. 1997 Dec. 11(6):665-71. [Medline]. Granger DK, Burd RS, Schmidt WJ, et al. Incidence and timing of infections in pediatric renal transplant recipients in the cyclosporine era. Transplant Proc. 1994 Feb. 26(1):64. [Medline]. Cox KL, Lawrence-Miyasaki LS, Garcia-Kennedy R, et al. An increased incidence of Epstein-Barr virus infection and lymphoproliferative disorder in young children on FK506 after liver transplantation. Transplantation. 1995 Feb 27. 59(4):524-9. [Medline]. Newell KA, Alonso EM, Whitington PF, et al. Posttransplant lymphoproliferative disease in pediatric liver transplantation. Interplay between primary Epstein-Barr virus infection and immunosuppression. Transplantation. 1996 Aug 15. 62(3):370-5. [Medline]. Green M, Michaels MG, Webber SA, et al. The management of Epstein-Barr virus associated post-transplant lymphoproliferative disorders in pediatric solid-organ transplant recipients. Pediatr Transplant. 1999 Nov. 3(4):271-81. [Medline]. Ho M, Jaffe R, Miller G, et al. The frequency of Epstein-Barr virus infection and associated lymphoproliferative syndrome after transplantation and its manifestations in children. Transplantation. 1988 Apr. 45(4):719-27. [Medline]. Broyer M, Tete MJ, Guest G, et al. Varicella and zoster in children after kidney transplantation: long-term results of vaccination. Pediatrics. 1997 Jan. 99(1):35-9. [Medline]. Furth SL, Sullivan EK, Neu AM, et al. Varicella in the first year after renal transplantation: a report of the North American Pediatric Renal Transplant Cooperative Study (NAPRTCS). Pediatr Transplant. 1997 Aug. 1(1):37-42. [Medline]. Broyer M, Boudailliez B. Varicella vaccine in children with chronic renal insufficiency. Postgrad Med J. 1985. 61 Suppl 4:103-6. [Medline]. Hardy I, Gershon AA, Steinberg SP, LaRussa P. The incidence of zoster after immunization with live attenuated varicella vaccine. A study in children with leukemia. Varicella Vaccine Collaborative Study Group. N Engl J Med. 1991 Nov 28. 325(22):1545-50. [Medline]. Zamora I, Simon JM, Da Silva ME, Piqueras AI. Attenuated varicella virus vaccine in children with renal transplants. Pediatr Nephrol. 1994 Apr. 8(2):190-2. [Medline]. Chugh KS, Sakhuja V, Jain S, et al. High mortality in systemic fungal infections following renal transplantation in third-world countries. Nephrol Dial Transplant. 1993. 8(2):168-72. [Medline]. Chugh KS, Sakhuja V, Jain S, et al. Fungal infections in renal allograft recipients. Transplant Proc. 1992 Oct. 24(5):1940-2. [Medline]. Tolkoff-Rubin NE, Rubin RH. Opportunistic fungal and bacterial infection in the renal transplant recipient. J Am Soc Nephrol. 1992 Jun. 2(12 Suppl):S264-9. [Medline]. Neu AM, Fivush BA. Recommended immunization practices for pediatric renal transplant recipients. Pediatr Transplant. 1998 Nov. 2(4):263-9. [Medline]. Enke BU, Bokenkamp A, Offner G, et al. Response to diphtheria and tetanus booster vaccination in pediatric renal transplant recipients. Transplantation. 1997 Jul 27. 64(2):237-41. [Medline]. Mathew JL, El Dib R, Mathew PJ, Boxall EH, Brok J. Hepatitis B immunisation in persons not previously exposed to hepatitis B or with unknown exposure status. Cochrane Database Syst Rev. 2008 Jul 16. CD006481. [Medline]. American Academy of Pediatrics. Report of the committee on infectious diseases. Pickering LK, Baker CJ, McMillan M, Long S (Editors). Red Book. 27th Edition. 2006. Crespo M, Collado S, Mir M, et al. Efficacy of Influenza A H1N1/2009 Vaccine in Hemodialysis and Kidney Transplant Patients. Clin J Am Soc Nephrol. 2011 Sep. 6(9):2208-14. [Medline]. Penn I. Incidence and treatment of neoplasia after transplantation. J Heart Lung Transplant. 1993 Nov-Dec. 12(6 Pt 2):S328-36. [Medline]. Mongeau JG, Clermont MJ, Robitaille P, et al. Study of psychosocial parameters related to the survival rate of renal transplantation in children. Pediatr Nephrol. 1997 Oct. 11(5):542-6. [Medline]. Birk PE, Matas AJ, Gillingham KJ, et al. Risk factors for chronic rejection in pediatric renal transplant recipients--a single-center experience. Pediatr Nephrol. 1997 Aug. 11(4):395-8. [Medline]. Etiology of end-stage renal disease in North American children. Data from Annual Report North American Pediatric Renal Trials and Collaborative Studies (NAPRTCS), 2007. Etiology of end-stage renal disease in children aged 0-18 years by age group. Data from North American Pediatric Renal Trials and Collaborative Studies (NAPRTCS) Annual Report, 2007. Management of end-stage renal disease in US children aged 0-19 years by age group. Data from US Renal Data Systems, 2008. Simplified diagram illustrating the points of action of immunosuppressive drugs. Corticosteroids inhibit production of interleukin-1. Macrolides (ie, cyclosporine, tacrolimus, sirolimus) inhibit production of or use of interleukin-2, thus inhibiting stimulation of a clone of cytotoxic T lymphocytes directed against specific human lymphocyte antigen types. Antimetabolites (ie, mycophenolate mofetil, azathioprine) inhibit purine production, thus impairing cell proliferation. Antibodies impair normal function of cell surface markers, thus inhibiting stimulation of T-lymphocyte clones directed against foreign antigens. Diagram provided by David A. Hatch, MD, copyright 2001, used with permission. Comparison of imaging techniques for a living kidney donor. (A) Digital subtraction angiogram showing lower pole artery. (B) Three-dimensional CT scan depicting 2 left renal arteries. Images provided by David A. Hatch, MD, copyright 1999, used with permission. Incisions used for kidney transplantation. (A) Gibson incision used for large children and adults. (B) Midline abdominal incision used for small children. Vascular anastomoses used in a kidney transplantation in a 5-year-old patient, renal artery to common iliac artery and renal vein to common iliac vein. Image provided by David A. Hatch, MD, copyright 2001, used with permission. Anastomosis of kidney transplant ureter to bladder. Anastomosis of kidney transplantation. Ureter to (A) bladder augmented with a patch of bowel and (B) urinary conduit constructed from a segment of ileum. Kidney transplantation ultrasonograms. (A) Normal kidney. (B) Color Doppler ultrasonogram documenting normal perfusion to the kidney. (C) Color Doppler ultrasonogram showing absence of perfusion in a patient with thrombosis. (D) Hydronephrosis. (E) Lymphocele. (F) Stone in a kidney transplant. Images provided by David A. Hatch, MD, copyright 1998, used with permission. Nuclear renograms of kidney transplantations. (A) Normal perfusion. Note that the isotope is observed in the aorta, iliac vessels, and the kidney in the first image (0-5 s). (B) Normal tubular function and drainage. Note that the isotope is rapidly excreted and drained. The highest concentration of isotope (darkest image) is observed in the first image (0-3 min). (C) Delayed perfusion in a patient with acute rejection. Note that the isotope is observed in the aorta and iliac vessels in the first frame (0-5 s), but the kidney first shows uptake of the isotope in the second frame (6-10 s). (D) Decreased tubular function in a cadaver kidney transplant with acute tubular necrosis. Image provided by David A. Hatch, MD, copyright 2001, used with permission. Digital subtraction angiogram showing renal artery stenosis. Image provided by David A. Hatch, MD, copyright 1998, used with permission. Histology of percutaneous kidney transplantation biopsy. (A) Normal kidney. (B) Acute rejection. Note the infiltration of lymphocytes. Images provided by David A. Hatch, MD, copyright 1999, used with permission. Actual kidney transplantation survival in North American children. Data from US Renal Data Systems, 2008. Etiology of kidney transplant loss in children. Data from US Renal Data Systems, 2008. Pediatric patient survival following kidney transplantation. Data from US Renal Data Systems, 2008. Cause of death among pediatric recipients of kidney transplantation. Data from US Renal Data System, 2008. Donor source of kidneys transplanted into children. Data from North American Pediatric Renal Trials and Collaborative Studies (NAPRTCS) annual report, 2007. Probability of first rejection at 12 months following transplantation. Data from North American Pediatric Renal Trials and Collaborative Studies (NAPRTCS) annual report, 2007.